MP3 & PDF files availabile for instant download. Paper will be shipped. Learn it and all of a sudden people close to you want to move closer. Strangers you just met feel drawn to you. The people that never liked you begin to change their minds. Your children, spouse, and co-workers mysteriously begin " feel understood," many times for the first time. As you can imagine we're talking about some powerful stuff. Many people think that learning relationship strategies is boring and complicated. I can promise you nothing is further from the truth. You will wonder why you didn't make it a priority years ago. After 29 years of relationship research and development, I have learned that people don't want you treating them like you want to be treated. They want you to treat them like the ywant to be treated. That is why I developed "The Platinum Rule". Now you can learn these powerful, proven strategies in your car on the way to the office or when you are out doing sales calls (This will help you sell more than you can possibly imagine). 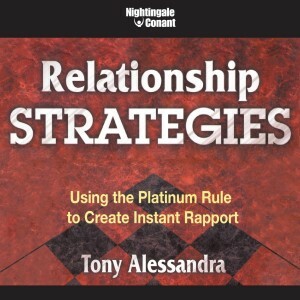 I have gone to the studio and put everything into my brand new audio album called The New Relationship Strategies: Using the Platinum Rule to Create Instant Rapport. It's six hours of entertaining and powerful content with numerous professional actor vignettes and live story segments. I'll wager that it just might be the very best audio album you've ever heard-in terms of content, delivery, and production value. From these CDs, I will personally help you master The Platinum Rule. Even after listening to the first CD, you will know how to get along with people better than ever. Immediately, you will start connecting with people easier and faster. You will notice how powerful your communication skills have become when talking with your co-workers. And they will notice it too. People will begin coming to you for advice. You will become a leader in their eyes. You will notice it when conflicts come up-- how quickly you are able to bring arguments to a halt. You will be able to build rapport with anyone you choose. That means your communication will get the results you want in any business situation, no matter if you are closing a sale or motivating your team. - You fully understand the four basic behavior types and how to deal effectively with each one. - You know how to easily determine the personality style of everyone you meet in a few short minutes. - You improve your compatibility with anyone and everyone. - You get to genuinely know and understand what makes people tick. - You understand why you act the way you do. - You improve your productivity and clear the way for career advancement. Companies regularly pay many thousands of dollars for me to share these strategies with their audiences. Now you can listen to them, all six hours of them, as many times as you need to. You can strengthen your relationships forever. Start seeing people differently. Learn to adapt to their behavioral styles and you will walk away the winner in their eyes and yours. You really won't believe the difference these powerful strategies will make in your life and the lives of everyone around you.